As you are reading this I’m enjoying a hot cuppa coffee in a sweet little café in Lille, France with my mom and sister. We’re here for the day to shop the new collections and enjoy some time away from our hectic home. If I have to believe my mom, living with 4 teenagers can be hard… Wait, what does she mean by that? Since the boyfriend doesn’t really like to be my photographer all the time, and I’m still not used to the whole tripod thing I asked my friend J if she wanted to help me out. We had a great time during this shoot in a muddy field. You should have seen her, jumping around and trying new angles. So fun! I spotted this purple cardigan at the bottom of a large pile of clothing at Zara when they were having a sale. If you know how Zara looks during the sales you’ll know that this is quite impressive. I have been living in this thing since. I suggest you all get one, it’s amazing with how much it goes! Purple is a great colour on you. It looks such a lovely day there we need a bit more sunshine! Lovely look! Love the soft colors! 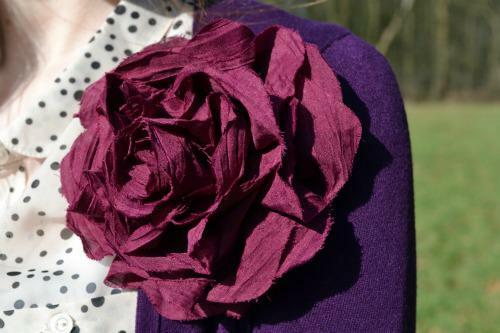 I LOVE the purple cardigan and brooch, the colour definitely flatters us redheads! Oh i love this outfit! I need boots like this. Oh how I wish I could hop on over to France! You look beautiful. I love your outfit and that pretty flower brooch. What pretty colors on you. And your friend did a great job taking your pictures. i LOVE the purple cardigan and the big purple flower 🙂 so fun and gets me so excited for spring! You always have the cutest, cutest outfit pics…totally jealous! I'm also very envious of your time in France…wish I could be sipping coffee and shopping there. Bring me next time! 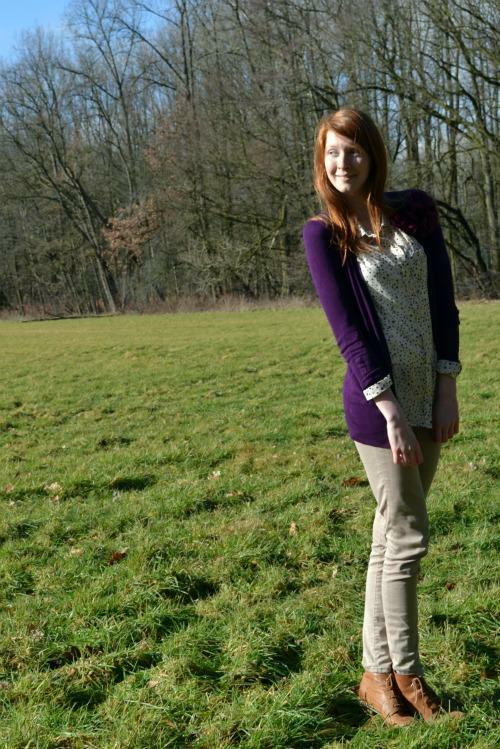 LOVE the purple sweater, also your boots–they are really adorable. You look lovely, the shirt is so pretty! wat mooi! het lijkt wel superwarm! How fun that your friend took your pics for you! She must have had fun. Love your outfit & the color of your hair!!! Oh that color is beautiful on you! I love the rosette too! Purple looks so pretty on you! I love the polka dot blouse with your pretty cardigan. The flower pin is very cute too. Sounds like a fun time to go shopping in Lille! I love the sweater and it looks great with the shirt and shoes! 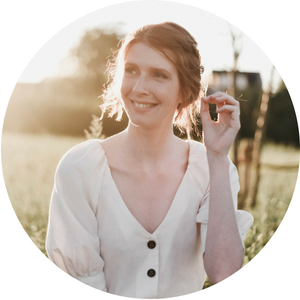 I'm following you on bloglovin, GFC and pinterest. Thanks for your nice comment on my blog and I hope you'll follow back! I love your pretty blouse! Such a perfect transitional piece into Spring! Wat een leuke outfit, die cardigan is zo leuk!! Beautiful photos, I love it! I love that patterned shirt and the flower pin – too fun! super cardigan, die kleur staat je echt echt fantastisch en zo een leuke fit! Leukeoutfit. Vriendjes die foto's moeten maken das altijd moeilijk denk ik. Geweldig als vriendinnen het dan wel graag doen :). your boots are too cute! it looks like they go with everything and such a great color, too. i haven't seen sunshine for like one week!wish i was there!pretty look! Ooh, your trip to France sounds so exciting! I hope you can find something good 🙂 And yay for friends to take pictures! Jolien did a great job. And I love that purple cardigan! I love the flower touch! Very SJP circa 2012! Love your purple cardi and flower!!! You are so so so beautiful. I love your complexion. I love this color combo–sweet and subtle!